An outstanding Jipin grade Baijiguan tea from the Wuyi Mountain. 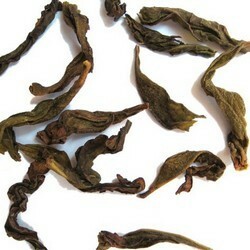 This lightly roasted oolong was harvested from the Big Rock in June 2009. The word Baijiguan means White Rooster Crown. His tea buds are a light yellowish green with downy hairs, resembling a rooster crown. Famous for his curative property, he became a tribute tea during the Ming dynasty. He later became the No 3 of the Famous Tea Bushes, ranking after Dahongpao and Tieluohan tea. Not an easy tea to make, the White Rooster is truly rare. Despite the widespread fame, only a small quantity is produced each year. He is in a class of its own, unlike any other roasted teas you had before. The dried leaves are a dark, yellowish green. The liquor is a creamy bright amber with a golden luster. Take a deep breath. Can you detect the minty fragrance floating around? It is as if the air is not moving! Take a sip. He is smooth and mellow, with no astringency whatsoever. The taste is exquisitely complex, a combination of flowers, herbs and fruits. Can you feel things moving in your mouth? Do you get the fresh and lively sensation? Get the after-feelings. Observe how your palate remains aromatic and silky long afterwards.